The Verizon IndyCar driver is eager to get back into his Schmidt Peterson Motorsports Honda race car after his serious May 2015 crash at the Indy 500. During practice laps at the famous Indianapolis Brickyard his vehicle experienced a mechanical failure and he slammed into the concrete walls at high speed, putting him in the hospital for several surgeries and off the track during the balance of the 2015 season. 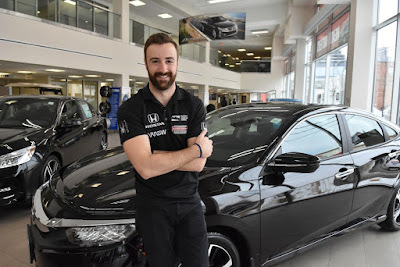 He acknowledges that 10 months off the track is a long time for a competitive driver, but racing is what it is all about and he worked hard to get back into the car. The recovery is progressing well and his pre-race training ends with next week's IndyCar season opener at the Grand Prix of St. Petersburg on March 13, 2016. Not only is he back with his old team and major sponsors like Arrow Electronics, SPYDER and Honda in the Number 5 car, he returns with new sponsorship from Petro Canada Lubricants. 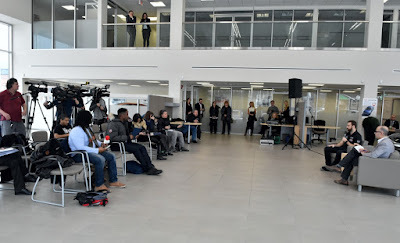 He said that he is very pleased to have some Canadian sponsors and to wear another Maple leaf on his race suit. This is the home stretch and his engine will be fired up next week for the real deal. 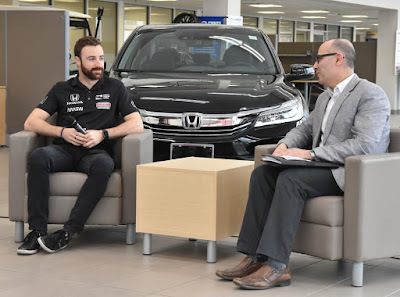 Welcoming him back to the race season was Daniel Torchia who led a James Hinchcliffe meet the media event at Toronto Downtown Honda on Monday, March 7, 2016. We spent some time discussing the accident and the long process to get back up to speed. James doesn't remember the crash itself, he blacked out during the impact and is impaled by part of the suspension. Emergency personnel get him out of the damaged car and transported him to a nearby hospital where the first surgeries began within an hour. When he wakes up and meets the doctors he can only communicate by pen and paper, so one of his first questions was when can he get back into a race car? His doctor asked what was wrong with him and he simply said he was a race car driver. Getting better meant strength training on the core and upper body, later followed by leg exercises. One of his major concerns was about the injury to his neck. 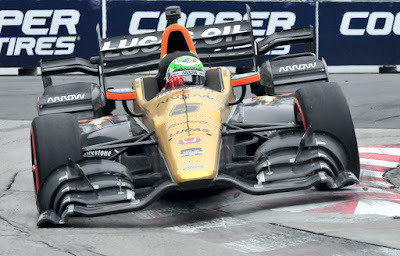 Driving at high speeds, especially on street courses like the bumpy track in Toronto, puts quite a strain on the neck. Getting back into the car relieved him of his concerns and he said that once he got it out onto the track his normal life resumed. While PlayStation kept him a little occupied in the off times, he really kept busy with training and being on race track sidelines monitoring the cars and their drivers. He really felt that the support he received was overwhelming and he appreciated the time that people took to reach out to him with cards, cards and messages. 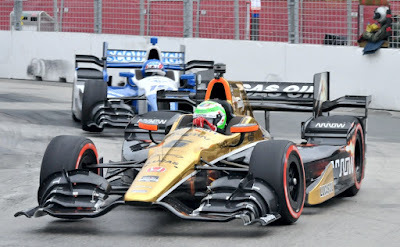 These are some photos of James at the 2015 Honda Indy Toronto. 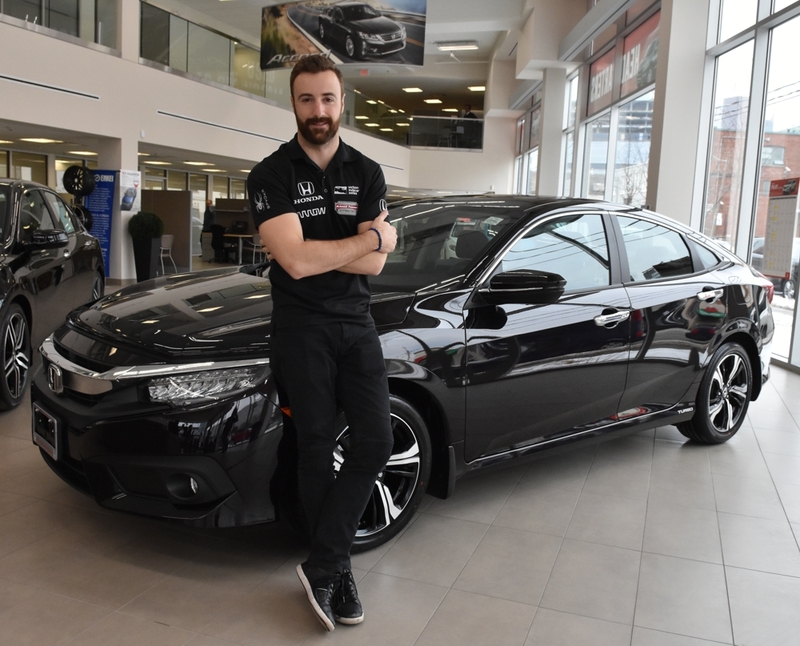 The Mayor of Hinchtown will return to Canadian tracks during the Honda Indy Toronto 2016 weekend race from Friday to Sunday, July 15-17 in Exhibition Place.